Here’s a good way to get a Monday morning post done in advance – prep it on Friday! February 2018 photos. 4 photos of Jackie, 3 others with people in them, lots of food and drink and even some knitting and spinning photos. AND the first flowers of the season. (You are so dang organized!) What a lovely month you had . . . full of love! It’s all lookin’ good Carole! Jackie is growing so fast! Aw, Jackie… first & last and a couple in the middle. Looks like a pretty great month. As usual, your photos are filled with beauty and love, Carole. Nice variety! Jackie is changing so fast—he’s growing “like a weed”. 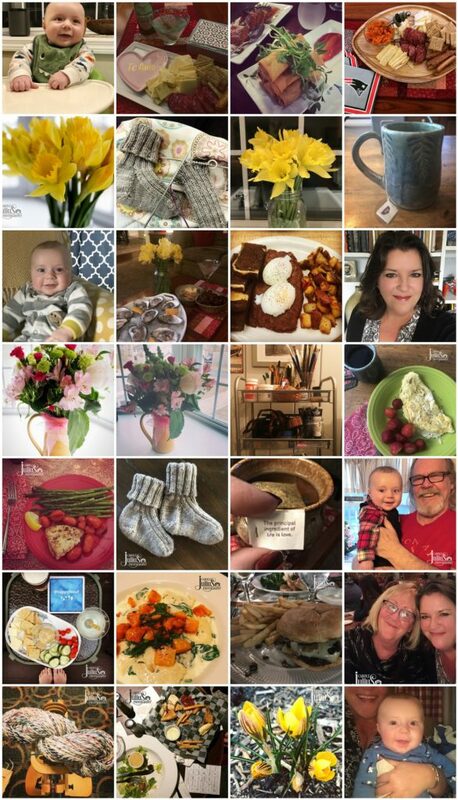 A nice mix of friends, family and food (and flowers! )!